BSDN 2nd to Last Dance EVER! After over 26 years of bringing live music to the Boston Swing dance community, the Boston Swing Dance Network will be holding their 2nd to last dance EVER this Saturday, September 14. The dance is held in Watertown and this month features Doc Scanlon, a long time band playing for BSDN. Read more about BSDN 2nd to Last Dance EVER! Class details and registration are up for the Skye Humphries & Naomi Uyama weekend scheduled for November 29-December 1. This will be year number 6 for what has become the annual Skye-Naomi-Gordon weekend. A not-to-be-missed event! There are two new registration options you can take advantage of now! Special Full Package Discount Payment by September 25! For only $100 you can get 9 workshops with Skye & Naomi plus Uptown Swing with Gordon Webster on Saturday night. That is an excellent price to experience the full weekend with this incredible lineup of talent. Register by September 28 to take advantage of the 3 month online installment plan. Combine this with the Special Full Package Discount for monthly payments of only about $33 to get the entire weekend! Also available for all other registration options. Now that’s easy! The new season of dancing is upon us! Plus September marks the 18th anniversary of Hop to the Beat. Wow! We never could have imagined back in those early days, just hoping to get some people interested in dancing Lindy Hop, that this is where we would be today! A new 6 week class session starts Sunday nights on September 8 in Newton Lower Falls and Monday nights on September 9 at Ruggles Church (near Fenway Park). There are classes for all levels, no partners required. Students are going back to class and you should too! If you have been wanting to learn how to dance, now is an excellent time to start. Uptown Swing dances continue this fall at KI in Brookline. This wonderful space has a very large wood floor, AC and is conveniently located just a few blocks from Coolidge Corner on Harvard St. On street parking is available as well as several town lots nearby. Public transportation is very accessible with 2 nearby T stations and a bus that stops out front. KI has been an awesome venue for Uptown Swing, although it comes with scheduling challenges as requested dates are not always available. Please note that the September dance will be held at Extreme Dancesport in Cambridge. Another wonderful venue! Uptown Swing is friendly and fun with a live band each month. 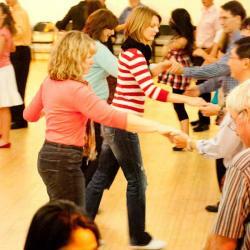 A lesson is included which starts at 8:15pm and the dance at 9:00pm. All levels are welcome and no partners are needed. The Boston area is jam-packed with things to do this fall and here are some highlights of what’s coming up. Boston Swing Central is hosting an exchange for the weekend of September 26-29. An exchange is an event focused on social dancing where visiting dancers get to experience the local community and a taste of the area. Bands featured are Jan Marie & the Mean Reds, Mona’s Hot Four+3, Gordon Webster Band and Tin Pan Band. Boston Balboa is hosting a special weekend of small group Balboa workshops on October 4-6. Classes are with some of the world’s best Balboa instructors including Bobby White, Kate Hedin, Nelle Cherry and Adam Speen. For Balboa enthusiasts, this will be the place to be! Check the TinkerBal details and registration information. Providence Swings is hosting a day of Solo Charleston workshops with the fabulous and multi-talented Jon Tigert on Saturday, November 2. Solo Charleston classes are fun and also an excellent way to work on your dance skills. There will be classes for all levels. Workshops will be followed by The Lindy Hop Stomp Dance. The Boston Swing Dance Network has been bringing live music to the Boston Swing dance community for over 26 years! This dance was created when a Swing community was just getting started in Boston and Roger Weiss deserves high praise for keeping it going all these years. Lindy Hop might not be around today if it wasn’t for individuals such as Roger who kept Swing alive. BSDN’s last dances are on Saturday, September 14 and Saturday, November 9 in Watertown. Everyone should come out to celebrate this incredibly long run and to thank Roger for his many years of service. Information is now up and registration is open for the Skye & Naomi weekend coming up November 29 to December 1. This is the 6th time with this dynamic duo along with the always amazing Gordon Webster featured at Saturday’s Uptown Swing Dance. Every time this weekend somehow just gets better and better and is surely one of the best highlights of the year! Check out the special FULL PACKAGE early bird discount available through September 25! If you register soon, you can even take advantage of a 3 part installment plan to make your payments online. We had a great time at ILHC last weekend. It was incredibly busy as always, but as competition coordinators, we enjoyed interacting with all of the competitors and being a part of this wonderful event. There are a ton of videos up on YouTube if you want to check out all the amazing competitions. A special moment that stood out this year was Cyle & Alexis’ performance in the Junior division. We first met Cyle & Alexis a couple of years ago when, under the guidance of Valerie Salstrom in Cleveland, they first competed at ILHC. This past summer we had the pleasure of hosting them at Beantown Camp, which they attended as Frankie Foundation Ambassadors. It has been wonderful watching their progress, topped off by their 2nd place win! It was truly awesome seeing how natural, relaxed and confident they looked during their routine. Frankie would be very proud!